From a less developmental point of view, I would like to agree with Katie’s assertion that reading and writing always were, always are, and most likely always will be isolating to some extent. Although pages like Wikipedia and Urban Dictionary create an open form that encourages, if not depends on, collaboration and overcoming isolation, I cannot imagine (and perhaps this is because of a lack of imagination on my part) an ideal world where reading and writing are performed in such a way that is strictly the opposite of isolating – and I’m not even sure what an appropriate term for that opposite would be because “collaboration” even on the internet still occurs at a distance, even with thru advent of video chatting technologies like Skype and Google Hangouts. To believe in an ideal world where reading and writing are not isolating, then, in my opinion, is almost like believing in an ideal text: it’s not going to allow for the kind of progress we really want to see. Besides, if I had to read and write under someone’s constant surveillance all in the name of dismantling isolation, I’d quickly get sick of it and refuse to do either ever again. I haven’t read Franzen’s piece, so maybe that is the source of my confusion, but I’m not yet clear on what it means to say that reading is “isolating.” I take it that it means something more or different than simply an activity we do alone–since few of us read either novels or Wikipedia pages in the company of others–but then I get confused about what it does mean, and how reading online might somehow be more or less isolating than reading print. Katie, you say that “most writing is still done for oneself and by oneself,” but I’m not sure I’m convinced of that as an empirical statement. I mean, I don’t think I’m writing for myself here, and to the degree that I’m imagining you and Chris and the rest of the class as I write this, my work doesn’t feel isolating. I look forward to hearing more about what you and Franzen (and maybe Baron, too?) are trying to get at here. I think this issue of “isolated” v. “collaborative” writing gets really strange when thinking about the range of meanings that collaboration takes on. Chris, I think I see you making a distinction between collaborative texts like Wikipedia pages versus single author texts like personal blogs (I apologize if I’m misreading!). In this sense, collaboration takes the form of active teamwork with another writer. I think the difference between this kind of writing and “isolated” single-author writing is mostly, if not always, clear, and I can definitely agree with your frustration at the idea of always having to write on a collectively created and edited text with other active writers. I’m not necessarily trying to differentiate pages like Wikipedia from personal blogs but instead trying to suss out how they possess different dynamics between writer and reader. In my original response, I was thinking of collaboration in too physical a sense, so I definitely see the point you’re trying to raise about how a majority of digital writing is never truly “alone” because it breaks down the private vs. public dichotomy! Everyone seems to agree about the existence of collaborative writing. My inclination is to take the idea of collaborative reading to its parallel in social constructivism and bring in Stanley Fish or other reader-response theorists. If our entire system of perception is culturally-based (and there is nothing at all inherent in a text when divorced from a reader) then our reading strategies are also necessarily culturally-based and thus collaborative. This is something that would be true regardless of time period. But I don’t think that’s necessarily a very useful contribution. Perhaps it would be better to consider the ways in which our experience of reading is influenced by context, genre, and media? I feel like those might be the complementary rhetorical elements that determine the ways that we read and what kind of readers we can be. Just to muddy the waters even further, Wikipedia and other similar sites do have an interesting range of collaborativity though. Especially with the pages of hotly-contested topics, changes are made frequently by countless contributors, usually with the goal of maintaining objectivity. However, I love when I run across a little stub of an article in a back corner of Wikipedia–perhaps on an obscure 19th century figure, knowing my search habits–that has clearly been written mostly if not entirely by one person who is noty only knowledgeable, but has a genuine affection for what they are writing about. This entry feels slightly less matter-of-fact than most others, and while it may therefore be slightly less objective, there is the chance that because of its obscurity, that will never be “fixed.” Do we find this sort of imbalanced collaboration problematic in depositories of writing that declare themselves collaborative? Okay, so now there are multiple levels of comments and ideas here, and I think I should also step in and define Franzen’s terms better (and I’m not sure to what level I actually agree with him since he says in the essay both P and ~P) and then join this fantastically fun conversation. To go back to Joe’s question, which asked me to define the term “isolating” better (which was definitely lacking in my piece! ), I think that Franzen and Wallace would say that this isolation directly correlates to the development of an internal thought life and the development of an internet culture which keeps people from interacting face-to-face and keeps them reading and writing in such a diverse spectrum of places that they cannot connect as deeply to other people (the kind of people who would have, pre-technology, been in their reading and writing communities). Now, I agree that some degree of thought that occurs in reading and writing has to happen in one’s own head (a sort of isolation, as I also believe that it is impossible to really, truly communicate every idea and experience–qualia–that one has), but I also believe that Franzen and Wallace overlook the fact that all private thoughts and mechanisms of private thoughts are pieces of cultural development. 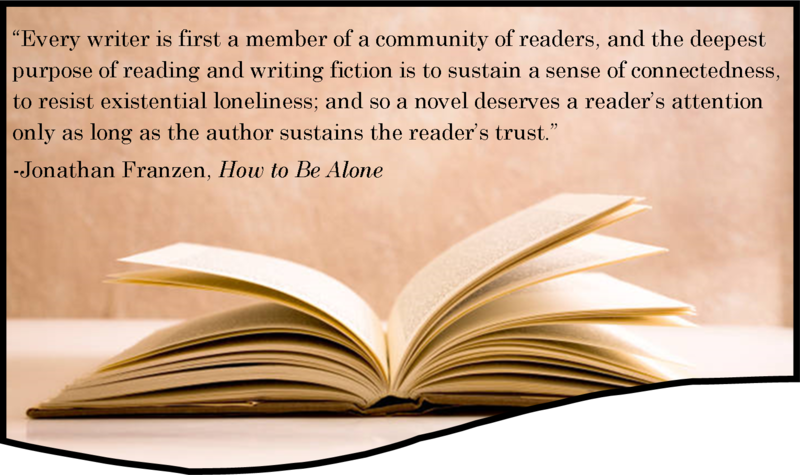 First, when Franzen talks about isolation, he means that not only is reading and writing done by an individual in private, but that the sort of “mulling” that happens after a reader or writer engages with an idea is an activity that has to happen by oneself (no one can work out an idea for me). I have to think through this problem; I have to write this text; I have to define my own terms. Franzen’s definition doesn’t account for the fact that all of the mechanisms that I–the reader, writer, or reader-writer–bring to my act of reading and writing, which includes even the physical processes of the way I type or organize my thoughts or the way that I “come at” a problem, are things that I have developed as a result of my cultural upbringing. Thus I am never truly alone because I am a scrapbook of cultural ideas and influences. Thus even reading is collaborative in a sense because there are no ideas individual to me (some might argue with this, and I concede that I don’t have the best arguments for my position yet). Other people and other people’s ideas are always helping me along with the development of my own ideas that I’ve gathered during reading. I hope this long answer adds more to the discussion. Please do ask me to define more of my terms if necessary, as I sometimes use words haphazardly.